William Ackman, managing member and portfolio manager of Pershing Square Capital Management, captivated over 70 alumni with his keen insights into today’s financial markets and tomorrow’s economic future at a recent Yeshiva University Wall Street Committee reception held on June 22 at the offices of Credit Suisse. The recent turmoil in the financial markets could not deter the almost 100 students interested in careers on Wall Street who attended the first panel discussion of the “Wall Street Connection Series” on Sept. 22. The series’ first event—moderated by Daniel Posner ’91Y, managing director at D.E. 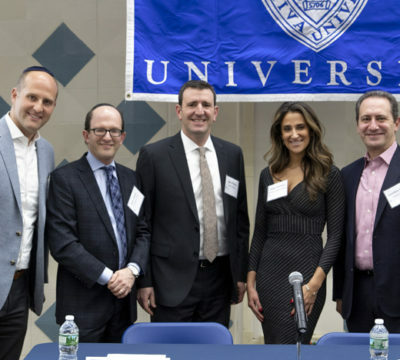 Shaw and Board member of the Rabbi Isaac Elchanan Theological Seminary—introduced students to career options in finance and featured alumni who have excelled in investment banking, research, sales and trading, and private equity/alternative asset management.